The Art of War by Sun Tzu - Book Review ? 'Translated in the year 1910, this scholarly edition of Dr. Lionel Giles is considered to be the best translation of the work till date. Originally written in the Chinese language by Sun Tzu in the 6th century BC, this is the most successful and the oldest Chinese military treatise in the world. 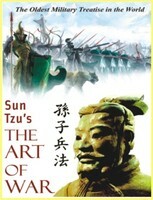 The contents of the book are based on Sun Tzu's own experience in different campaigns. The essence of the book is that positioning in war strategy is crucial. The Art of War is a guide for military generals written by an ancient Chinese general, Sun Tzu, nearly 2500 years ago and translated into English nearly a century ago by the British historian, Dr. Lionel Giles. For starters, I'd say that Maple Press, the publishers, have written a very misleading write-up at the back of the book. While it said that they were from the author's 'own experience', I expected an autobiographical work with Sun Tzu narrating a battle which he led and what he learnt from that experience. Instead this was like an instruction manual, with numbered points in each chapter. Despite that, I thought that there tips given by this general would be useful for anyone but they were all too 'war specific' and some of his points were totally outdated, such as all his points regarding cities with fortified walls, whereas you hardly have such cities these days. Besides, I found some of his points to be contradictory, although not blatantly so, but in such a way that the two can never get along together such as, he talks about how a good general should treat his subordinates like his own sons and later he says how he must make all his subordinates fear when he is in their vicinity. My very strong opinion is that if you make your son fear you, then you aren't a good father and that applies to the general too. Initially in the book, I was extremely annoyed when the I read an extremely vague simile and the translator, in his commentary says that there is no exact explanation for that in English. Another frustrating thing about this was the high usage of allusions, a device that I detest. However, the translator agrees that the ancient Chinese version available right now may not exactly be what Sun Tzu might have left behind and several pages might have been added / deleted. However, to say something positive about this, I found some of his thoughts to be rather interesting / strange. Being someone who lived during the B.C years, I expected him to advocate war ethics and I was in for a shock when he talked about deception and the use of spies being a necessity, ending the book saying, 'an army without spies is like a man with ears or eyes.'. The punctuation mark in the heading is not a typographical error and I used it only because I'm really not sure on whether what I've written is a review and that is up to you, the reader, to decide. Despite all these negative comments, I shall not dismiss the book completely as I strongly feel that I am not the correct person to judge this book. What he says might really be useful even for the present day generals and the people who are leading a team and being the carefree student that I'm, right now, I'm certainly not a member of the target group and I might probably find this work a little more meaningful later on in life. Regarding the rating, I've already mentioned that I'm not the right person to do so and hence I refuse. 'The hunt is on. The sinister Naga warrior has killed his friend Brahaspati and now stalks his wife Sati. Shiva, the Tibetan immigrant who is the prophesied destroyer of evil, will not rest till he finds his demonic adversary. His vengeance and the path to evil will lead him to the door of the Nagas, the serpent people. Of that he is certain. The evidence of the malevolent rise of evil is everywhere. A kingdom is dying as it is held to ransom for a miracle drug. A crown prince is murdered. The Vasudevs – Shiva's philosopher guides – betray his unquestioning faith as they take the aid of the dark side. Even the perfect empire, Meluha is riddled with a terrible secret in Maika, the city of births. Unknown to Shiva, a master puppeteer is playing a grand game. 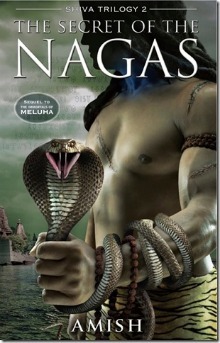 The Secret of the Nagas is the sequel to The Immortals of Meluha, in the Shiva Trilogy of Amish Tripathi. Although it is called a sequel, I wouldn't exactly put it like that; rather, I'd just say that the author has just split the same story into two books as The Secret of the Nagas starts from exactly where The Immortals of Meluha had its last full stop. Before you go any further, I'd advise you to not read this review in case you haven't read the prequel. After Swadweep's defeat in the war against Meluha, after meeting some of the people at its capital, Ayodhya, Shiva realises that the Chandravanshis (Swadweepans) are not evil and is convinced that it is the Nagas who are evil and his battle is against them. Shiva seeks vengeance against the Nagas for it was a Naga attack on Mount Mandar in Meluha which led to the death of Brahaspati the scientist and also Shiva's close friend. Nagas are those born to human with strange deformities and are mercilessly abandoned in the lands to the south of the Narmada river by Suryavanshis and Chandravanshis alike. Shiva goes to different places in Swadweep in search of the Naga who led the attack at Mount Mandar along with the Meluhan army general Parvateshwar and the Swadweepan prince Bhagirath. This book could effectively be termed as a travelogue of Shiva around Swadweep. I liked the plot in this, far better than that of its prequel along with interesting twists and turns combined with the picturesque descriptions of the places in Swadweep. It maintained a much higher pace than that of its prequel making it somewhat a page-turner. Despite the fact that the characters from the prequel are still as lousy as they were, the newly introduced ones such as Prince Bhagirath and the bandit Parshuram have been slightly better who are unlike the highly one sided characters of the prequel. On the flip side, what I said about for The Immortals of Meluha holds good here as well, such as the highly inappropriate dialogues and a pointless romantic sub-plot. The moment Sati and Shiva got married, I had thought that the romance in this trilogy had come to an end but little did I realise that the author would introduce a pointless one between Princess Anandmayi and General Parvateshwar. Besides, I found it frustrating that hardly anyone is referred to by their name, it is either 'My lord' or 'your highness' all the time. On a side note, I felt that Amish has probably started anticipating a film considering the popularity of his work since it had everything that a common Indian expects in a film, heroic acts from the protagonists, a battle and romance (just for the sake of it, like in the case of most Indian action films). This was better than The Immortals of Meluha, for sure, maintaining a far greater pace, a far better story and with good twists. What wasn't corrected after the first book won't be changed for the final book, I'm sure and the dialogues would remain lousy with the usage of modern Indian slang. This is a good read provided you've read the first book and since it is slightly better than the prequel, it also gets a slightly better rating, seven. '1900 BC. In what modern Indians mistakenly call the Indus Valley Civilisation. The inhabitants of that period called it the land of Meluha – a near perfect empire created many centuries earlier by Lord Ram, one of the greatest monarchs that ever lived. Is the rough-hewn Tibetan immigrant Shiva, really that hero? The Immortals of Meluha is the first book in the Shiva trilogy, a work of fiction which has become a sensation in India. Shiva is a Hindu god and according to mythology, he is the 'the destroyer of evil' but the author in this story has imagined Shiva to be a common man, leading a tribe at Mount Kailash in Tibet. Shiva leads the tribe of Gunas in Mount Kailash, where they are having to fight against other tribes everyday for survival, only to retain their possession of the Manasarovar lake. He is a very skilled warrior and is highly respected by his tribesmen. On one fine day, an army officer from the Kingdom of Meluha came up with a strange offer to the Gunas, that is, they could live in Meluha and lead peaceful lives. Meluha is a near perfect kingdom, highly efficient and a prosperous kingdom. Shiva accepts the offer but little did he know that Meluha had their own reason to come up with such a proposal since they were facing terrorist attacks from the enemy kingdom and they needed a saviour and legend had it that a foreigner would come to their rescue when all hope is lost, and the identity of that saviour would be that his throat would turn blue after the intake of somras, known as the food of gods. 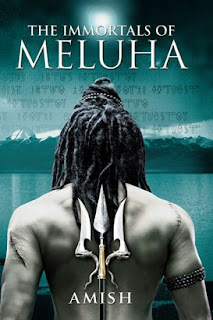 It so happens that Shiva is that saviour of Meluha, but what could a primitive tribe leader do? Is he ready for the task? Besides, what is the danger that Meluha are facing? The plot was rather vague in this book, that is, till the end, you don't know what is Shiva's actual task but that doesn't make it boring, by any means. The author is to be appreciated for coming up with this concept, seeing Shiva as a common man, whose good deeds have made him what he is today. The description of the various places in the book was excellent – bringing a clear picture into your mind but what disappointed me was the romantic sub-plot between Shiva and Sati especially during when the Meluhan emperor explains the role of Neelkanth and Shiva just runs off to see her dance. What was more disappointing was the dialogues and the characters; where the dialogue included words like 'goddamnit! ', 'in the name of god …' , 'bloody hell', etcetera – very modern usage, not that it is wrong to use such words as the author only tried to connect with the Indian youth but I felt it weird, the kind of setting you visualise and the kind of dialogue that is used. Coming to the characters, they were either 'this' or 'that', that is, there were some who blindly believed in the legend of Neelkanth and others such as General Parvateshwar, who just opposed it and continually screaming 'Jai Shri Ram'. One particular incident in the book even made me feel that the Meluhans lacked moral values, when a particular woman was saved by a Naga (a group of people detested by the Meluhans) from a crocodile but she was still squealing with fright thinking that the Naga was trying to attack her, instead of actually thanking him. From what I read, Shiva was the only person who was a little forward thinking. Though the Meluhans claimed that they were a perfect society, I personally believe that they are far from it and some of their systems were absolutely totalitarian. The fact that the place is a monarchy is the first blow and although the monarch doesn't inherit the post, he is only chosen by a select few. The vikarma rule and the Maika system aren't what a person would expect in a perfect society. I enjoyed reading the book, to say the least and partially, the reason could be because of the fact that my opinion on any mythological character is the same. Amish Tripathi is definitely a better choice than Chetan Bhagat, if a person is searching for Indian writing in the English language. Regarding the rating, The fact that it had a good story would take it to 6 and it can't come below that, and the concept would take it up to 7 but the poor dialogues and the simple characters would bring it back down to 6 and I hope there is an improvement on these lines in the sequel, The Secret of the Nagas. Recommended to: People who like to read crime fiction and those who love Rebus and Rankin's style of writing. 'MP Gregor Jack is caught in an Edinburgh brothel with a prostitute only too keen to show off her considerable assets. When the media horde begins baying for political blood Jack's friends rally round to protect him. But some of those friends – particularly his wife's associates – are not so squeaky clean themselves. Strip Jack, named after the card game Strip Jack Naked (Beggar my neighbour) is the fourth novel featuring Detective Inspector John Rebus and after solving a case at London in Tooth & Nail, he is back in Scotland. A significant change has taken place in Rebus' personal life, that is, he has regained a woman's support, with Rebus having started a relationship with Dr. Patience Aitken (but neither Rhona nor Sammy appear in this novel). The story begins with a police operation; raiding a brothel in a relatively high-class neighbourhood but, they happen to find the Right Honourable Gregor Jack MP, North and South Esk constituency (fictitious) inside, who, so far in the public eye, had been a 'Mr. Clean'. However, Rebus was convinced that there was something strange about it, considering the horde of reporters who were waiting outside the brothel during the raid, something which only the police had known. Jack's wife is missing and is eventually found in the river, murdered. MP Gregor Jack is bereaved and at the same time, is going through a bad time because of the brothel incident and John Rebus, is keen to uncover the mystery surrounding this incident. There is a variation in pace, compared to that of the predecessors (review(s) available, check the List of Reviews). The story doesn't begin with the murder and it happens in due course of the plot and till then, you only had Rebus wandering, casually talking to the MP who caught, was investigating in a case regarding stolen books and all these also gave time for the author to bring out the character of Patience Aitken. Rebus was as brilliant as ever (and so was Rankin's style of writing), much more interesting than what he was in the other novels, with his ingenious puns and cynicism. In my opinion, Rebus has become a much better detective now, maybe because Rankin too, has become a much better crime novelist. The plot was amazing, moving across several places in Scotland, several characters with different occupation, different background and personality but somehow all of them were connected to the case in some way or the other but at the same time I felt that the number of characters were too many which made me lose track of it, at times. It had nearly everything in it, an enthusiastic, slave-driving police detective with dull superiors and a troubled relationship, a politician in trouble with his associates trying their best to protect him and of course, a very good mystery supported with interesting investigations carried out by the police. I've always felt that a crime / thriller novel without an apposite end is meaningless, like in the case of the predecessors of the Inspector Rebus series but finally, the author has managed to deliver a fitting end to a good plot. Thankfully, there are 14 more novels in the Inspector Rebus series and I hope the upcoming novels are even better than Strip Jack. 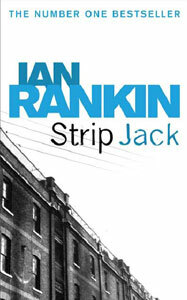 I was always told that the initial works of Ian Rankin weren't all that impressive but I was more than satisfied with Strip Jack. After reading the publisher's write-up, I initially didn't like the idea of a story based on an incident that takes place at a brothel, of all places but it wasn't as bad as I thought it would be although, I would have preferred some other location but the aforementioned location probably suits the plot best. After a slow start, the plot maintained a good pace which kept me gripped to the novel, to the extent that someone as slow as I am, could complete a 278 page novel within a week. Considering the plot, the twists and turns and the presence of John Rebus, I shall happily give this book a rating of 8/10 and to all those who quit reading the Inspector Rebus novels, reconsider your decision and read Strip Jack. ‘”Once I’ve hair, I’ll be happy”. At least that’s what Irish ex-army sergeant Daniel McEvoy tells himself. As doorman at a seedy New Jersey casino, dealing with unpleasant customers, a psychotic neighbour and a receding hairline are all part of Dan’s daily grind. Then he has a particularly bad day. Not only does his friend, dodgy doctor Zeb Kronski, mysteriously disappear, but Dan’s sometime-girlfriend, casino hostess Connie, is found with a hole in her head. Eoin Colfer, the author of the best selling Artemis Fowl series, tried to come out of his adolescence, and when I say adolescence, I mean Eoin Colfer, the author. Although he mainly writes fantasy, he did try to come out of that world on three occasions, them being the work of Half Moon Investigations, Airman and the continuation of the late Douglas Adams’ Hitchhiker’s guide to Galaxy, And Another Thing. However, this is Colfer’s first original work meant for adults and is also his crime debut. Plugged is a story about an ex-military man who had served the Irish Army Daniel McEvoy and is now just a doorman at a casino in a fictitious New Jersey town, Cloisters. Apparently he has no problems, with only tonsorial concerns, as he looks like a seventy year old due to his baldness; until one day when he picks a fight with a certain influential lawyer. Since then, his colleague and girlfriend, Connie is found dead, his former employer and friend, Doctor Zeb Kronski goes missing, presumably dead, his house is ransacked and the worst part is that he is the prime suspect is Connie's murder case. He is being chased by a very dangerous drug dealer and the certain lawyer whom he had insulted at the casino. The only person on Dan’s side is a female police detective, a sort of ally who’d make you prefer your enemy. But Dan himself is a very dangerous fellow, who has undergone rigid military training but at the same time, has some psychological problems, such as, his missing friend’s personality was in his mind, created out of his imagination and had conversations with him. While Colfer is to be appreciated for trying to display his versatility and that is probably the only reason for which he needs to be appreciated for, as well. I felt that the plot was bad, to say the least, and the sequence of events occasionally made me wonder whether there was a plot at all. The writing was dull and I guess the author thinks that if he uses a couple of swear words in every page, he has successfully written a novel for adults. When I read a couple of pages from Ian Rankin’s ‘Strip Jack’, I felt, ‘this is the way in which a crime / thriller novel ought to be written. What Colfer has written is absolute nonsense’. I couldn’t differentiate between the plot and the sub-plot, probably there were two plots but they had one thing in common, both were lousy. I guess this is the first time Colfer has thought of setting his story somewhere outside the British Isles but, it wouldn’t have made a difference whether he had it in US or anywhere else since in any case, it is taking place at a fictitious suburb and I could hardly see anything American in the characters who were in the novel. The bottom-line is that Plugged is that it is a very silly and childish thriller and just an overpriced novel which I shan’t recommend to anyone and the current thriller writers have need not fear about Colfer at all if this is going to be his standard. While some might say that I’m being too harsh on Colfer since this is his first novel for adults, personally, I’ve very high expectations on Eoin Colfer. His Artemis Fowl series was the work that triggered the reading interest in me, who till then had been very sceptical about the particular hobby and it could be said that Astute is there today only because of Colfer. While I read several reviews before reading any novel, I had promised myself that I shall not read any reviews and the review I write for Plugged would be completely my own. I have very high expectations on the upcoming last Artemis Fowl novel, that is due to come in another three days, 10th July, 2012 that is. I hope it doesn’t turn out to be as disappointing as Plugged. I’d give this novel a rating of 3/10 and I could perhaps say that I’m being a little generous while I’m doing so. Nevertheless, I shall not write Colfer off completely as his first Artemis Fowl novel by itself wasn’t all that impressive but he could pick up in the upcoming novels and I hope he manages to lodge a strong comeback in his next thriller novel if at all he decides to write one again. Recommended to: People interested in knowing about Jesus, Christians (although some might find the author's findings to be blasphemous), people who are idle and are just curious (I had to mention this only because I couldn't put myself in any of the above mentioned categories). 'Millions of people have been brought up with the idea that Jesus' life-mission ended with Crucifixion, to redeem our sins. This is becoming an untenable proposition. Professor Hassnain, a leading cross-cultural researcher of the life of Jesus, presents another story. the Church in the West, over centuries, has gone to great lengths to remove evidence of this, to strengthen its position as the representative of Christ on earth. Citing many historical sources, Professor Hassnain, himself a Sufi, respectfully questions what we have been taught – and argues that Jesus was a greater man than we realise. Professor Hassnain, as Director of Museums and Antiquities for the state of Jammu and Kashmir, India, discovered records of Jesus in Ladakh, and subsequently used his position to research what is presented in this long-awaited book.'. Jesus, the son of Mary, who was a preacher and a prophet, whose teachings led to the birth of a new religion, Christianity, who was eventually crucified, and was miraculously resurrected and then ascended to heaven are the facts known by most people who are reading this review. However, the author challenges Christ's resurrection and talks about how he spent his life preaching in the east after the crucifixion. This book mainly concentrates on the lost years of Jesus that the Church is totally silent about and also about how Jesus survived his crucifixion and his life after that at Persia and Kashmir. Hassnain has his sources from Apocryphal, Buddhist, Islamic and Sanskrit texts. He begins his narration by telling his readers on how some of the places found in the Bible aren't found anywhere in Israel and nearby areas but are found in Kashmir, such as (Kashmiri name - Biblical name) – Asham – Ashema, Amairah - Amairah, Bethpore – Bethpoer, etcetera. He also talks about the close links between the Jews and the Kashmiris. A good thing about this work is that he had given immediate references for all his claims which are very important in any non-fiction, particularly on a controversial topic like this. There were also illustrations, on the route which Jesus took to various places and also several relevant pictures, which managed to rid the burden off her / his burden of having to visualise the locations based on the description. Any work which deals with a particular subject is difficult to read, especially the start but the author has to be appreciated for considering that, and starting with his personal experiences at Ladakh and how his interest on the topic aroused before going deep into the topic. However, I did find some of his claims to be absolutely wild without any basis, such as his conversations with Hindu and Buddhist monks during the lost years (although, I do agree that some were backed with Tibetan scripts). The author ended the book in a very positive manner, saying, 'I submit the results of my own work for the unbiased consideration of all people interested in the life of Jesus and the roots of Christian cultures, in the hope that this contribution be useful for future researchers in uncovering the truth about this important matter.'. I don't follow any religion as such and my stand on any mythological / religious figures is that even if they had existed, they were just normal humans, whose deeds, over the course of time, considering the human nature to exaggerate everything, has become miracles and they've become legends. Probably in 4000 AD, today's philosopher's may be worshipped and a religion may exist in their name. I just read this book out of idle curiosity and I did find it to be informative maybe because my knowledge on this subject was next to nothing and I might have been able to enjoy this book more if I had known a little more on the subject but however I can assure anyone in the position that was in a week ago that this isn't very difficult to understand and is informative. I always knew that the Muslims had deep respect for Jesus after reading it in a Turkish pamphlet received at Hagia Sophia but Hassnain, being a Sufi himself cleared these two queries; 'why and to what extent'.I found some of the things written book to rather strange which I enjoyed, such as 'in Mylapore near Madras (currently known as Chennai)' and that was the situation during Saint Thomas' time although this review that you're reading was typed at Mylapore which today is considered to be the heart of Chennai (Madras). 'Many in the West might question my credentials, because I happen to live in the East, and I am a Muslim. It is certainly not my intention to undermine the faith of any Christian.'. He certainly kept up his work. I don't find a point in rating non-fiction but as a matter of principle, that is, to rate any book that I review, I'd give this wonderful work an 8.